Ever wanted to just say ‘screw it’ and travel full time? Well that is exactly what one couple did. I have been following along Gnomad Home’s van life story since the beginning and find it so inspiring. I have been wanting to interview them for some time and finally got the chance to do so! Disclaimer: All photos in this post are property of Gnomad Home. 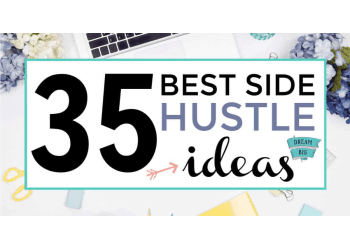 Want to start a blog like this one and make extra money while doing it? That extra money could help you to travel full time too. Start a blog with Bluehost! If you sign up for Bluehost with my link you get a free domain, free site builders, free 1-click WordPress install, 24/7 support and all for only $2.95 a month! You really can’t beat that deal. 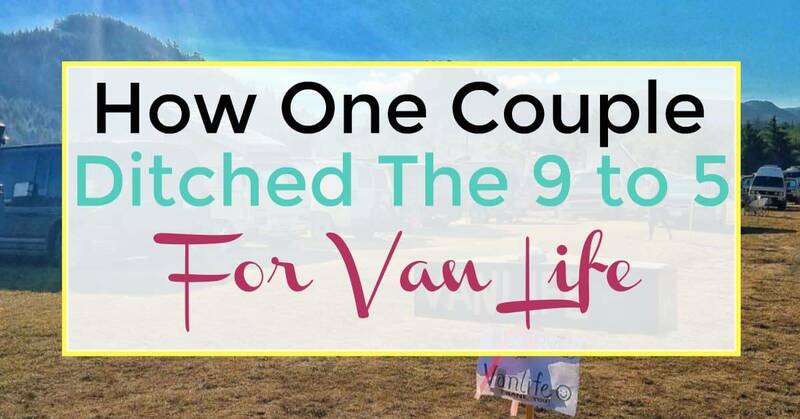 Want to ditch your 9 to 5 for van life too? Or maybe just camping, traveling full time and living a life of adventure? Read on and maybe you might have that ‘breakthrough’ in your thinking to take the plunge! We are a quirky family of five: Jayme and John (humans), Nymeria and Crow (dogs) and a big gold van named Gnomie. Until recently we were living in the suburbs, working 9-5 jobs, and feeling dissatisfied with our lives. That kind of lifestyle may work for some, but it’s definitely not for us, and life’s just too short to mortgage it away for an uncertain future. So, we sold everything we owned, bought a 1996 Chevy Express conversion van (Gnomie), turned it into a mobile home on wheels, and now we live in our van and travel full time. What turned you guys on to van life? We have always been adventurers. We met serving in AmeriCorps NCCC, a service organization in which you travel around the country working with nonprofits and responding to disasters. We’ve backpacked around Southeast Asia together. We’ve traveled to Ireland and Colombia. Before “van life” we had experienced most of the eastern half of the United States together. 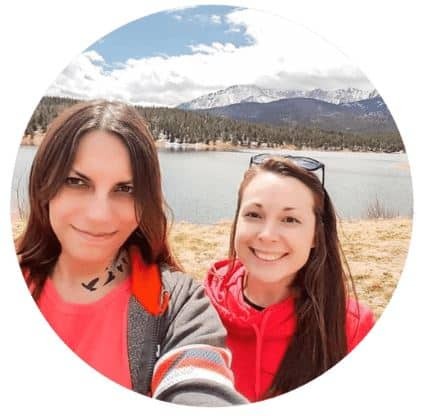 In between our travels, though, we were following in the illusory footsteps of the perceived “American Dream.” We had bought a house in the suburbs of St. Louis, MO, had gotten married, and found ourselves stuck in jobs we hated because we had bills to pay. We always dreamed of quitting our jobs to travel, to go on “one last hurrah” before having kids. Originally we were thinking of doing a longer backpacking trip, but then we got a dog and decided to explore North America so we could take her with us. At first the plan was to buy a small SUV and tent camp our way around the US, then one of our best friends told us to check out the hashtag #vanlife of Instagram. This was our brief but exciting introduction to this alternate style of living, and we immediately knew it was for us. How did you decide to just go for it already and be van lifers!? We saw people from all different backgrounds living full time and part time out of these very miniature homes they had created. It was exhilarating going through all of these different accounts we were coming across. We juggled a lot of “We should do this! !” .. “Oh my goodness, no we can’t do this!” for a few days before we decided – screw it! Let’s get a van! Then we lived on Craigslist for weeks looking at vans. Refreshing our feeds and checking every single location literally ALL. DAY. LONG. Hours and hours and hours and hours of researching what kind of vehicle we wanted and then seeing if we could find it. How did you guys plan out and save money for van life? The very first things we had to do was decide what to do with all of our stuff. We had a three bedroom two story house that we had managed to FILL with THINGS – EVERYWHERE! Do we pay for storage and come back to everything? Do we ask friends or family to store our stuff for us? None of the options seemed like a good idea. Then we realized – what if we didn’t have all of our stuff? So we decided to sell ALL of our belongings. Truly all of it. We sold our kitchenware, our decorations and souvenirs we had collected throughout our travels, our bed, our TVs, our cars, our sectional couch (which was the first large purchase we had ever made together), Jayme’s ENTIRE CLOSET of clothes. We sold all of it, and we made over $10,000 doing so. That helped us out a lot with the transition. 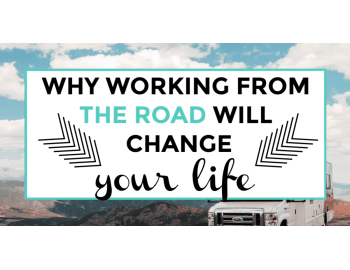 During this time, John was also in the process of starting an online business building and managing blogs and websites that generate affiliate commissions, and that now brings in a full time income that sustains us on the road today. What was your van conversion budget and did you make it? Our budget was $10,000 for everything including the purchase of the vehicle, and we basically hit that budget dead on. One thing we tell everyone wanting to do van life and is that when you make a budget you tend to hit that budget. If you have less to work with, you definitely don’t need to spend as much as we did. On the flip side, there are people who spend way more than $10,000. 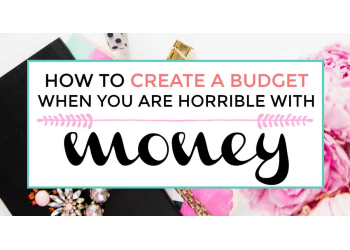 The point is, no matter your budget, you can find a way to make it work for you. How do you guys make money on the road? We own a few websites that generate affiliate income, mostly from Amazon. Our van life blog gnomadhome.com represents a big chunk of our income, but we have other websites as well. On our blog, we have detailed posts going over exactly how we built out our van. 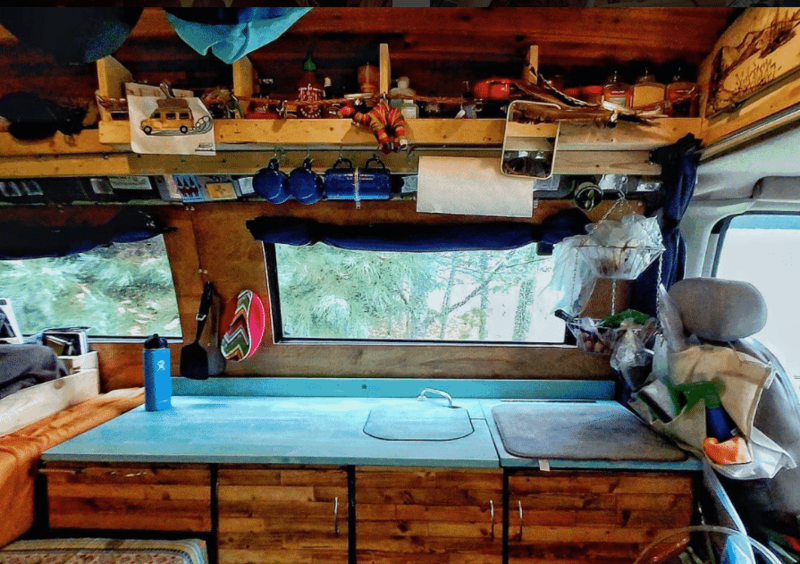 We also have a huge 21,000-word free resource on building your own campervan that breaks it down step-by-step, with recommendations and pros/cons for every budget and need. Many of the products we mention (all of which we actually use or have researched thoroughly) link out to Amazon, and if you click through one of our links and buy something, we get a small commission. The income we earn from this has been growing rapidly and now covers our expenses and then some. We also have a few other ways of making extra money on the road. Right now we’re working on an organic farm for the harvest season. And like many other van lifers we’re involved with social media and will occasionally do a sponsored post for a company that we believe in. But that’s really just a little extra gas money. Most of our income comes from our websites right now. We don’t really have a set monthly budget, although we probably should, haha. Our spending fluctuates from month to month and depends on a few different factors: how frequently we’re traveling, how much time we’re spending in cities, and how often we’re paying for camping. But we usually live very well on about $1800 a month. Our biggest expenses are gas (usually between $400 and $600, depending on how much we’re moving), groceries (about $500), and cell phone service with unlimited data (about $150). We try our best to stay away from cities and to camp for free on public lands, which really cuts down on costs. Not having to pay rent or mortgage is a huge bonus. What do your daily routines look like? Do you have any tips for van lifers starting out for saving money on the road? Downsizing would be our biggest suggestion. 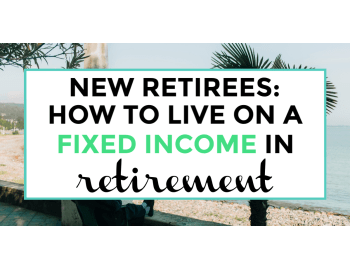 Not only does it give you a good financial start to the whole process, but it also helps you prepare for what you truly NEED. Living van life, you are living in a much smaller space, so the items you have with you at all times are only the most important items. We run to Goodwill about once a month with anything we haven’t touched in awhile because we don’t have the space to carry things we’re not using regularly. So definitely downsizing is a great way to begin. And just truly figuring out what’s important to you. Would you rather be living in a van traveling around, or would you rather be going out to the bar with your friends all the time? We had to make decisions like these a lot along the process, because anytime we went out on the town, that was time and money we were not able to put towards the van and hitting the road. You guys have 2 dogs with you on the road. Tell us a little about how pet care and van life works. Honestly, it’s very similar to before van life – except we get to spend a whole lot more time together as a family. We still go on walks (although now they are hikes throughout beautiful scenery instead of just a walk around the neighborhood), we feed them twice a day, they sleep in bed with us. We don’t really do anything the dogs cannot do, which the only big damper here is National Parks (dog’s aren’t allowed on the trails in National Parks), but they are totally allowed in National Forests which are always right outside the National Parks. Nymeria (2 and a half years old) loves the van so much. We always joke that we built the van for her. She is meant to be in the wild, she truly flourishes there. It’s so fun watching her agility skills as she glides over fallen trees and chases little animals all over the place (she doesn’t kill animals, she just enjoys the chase ). We rarely keep her on a leash or tether when we’re in the middle of nowhere. She never goes too far, and is much happier off leash anyway. Crow (16 years old) is very adaptable. She doesn’t care too much where we are or anything as long as she can poop, pee, eat, and has a comfy place to lay. But again, everything else is the same as when we lived in a van. We still do vet visits, they get their monthly meds, they get exercise. We don’t leave them in the van unattended unless it’s cool weather, and in those instances we make it quick. If it is too hot or anything, we will have one of us stay in the van to maintain temperature control while the other one runs in and grabs groceries or whatever. What are the top 5 essential items that make for a successful van life? (I just want to say that this question and the next one are very difficult to answer because it all varies on the traveler. My annoyances are mainly the things we run into in cities, whereas someone else may love being in cities and finds a lot of annoyances in the middle of nowhere. So just want to emphasize that these answers are for us personally, not for van lifers overall). This totally depends on the individual. A rock climber’s van is going to look entirely different than a musician’s van, and so on. I can try to come up with 5 things though, they just may not all be physical things. One thing would be figuring out the 3 things that are most important to you and your build and focus your build around that. Our 3 things would probably be a large bed, off-grid capabilities, and an ample amount of storage. Going along with this – figuring out what you are wanting to get out of van life. 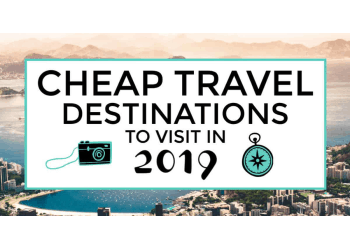 Are you wanting to visit more friends and family? Are you wanting to find more seclusion? Are you wanting to mountain bike, or run marathons, or go kayaking? Knowing what you want and aiming to give that to yourself is the best way to bring yourself success. Maybe having some basic vehicle knowledge? The less time and money you can spend at a mechanic the better. You’d be surprised the amount of money you can save if you know how to change your own oil, tires, etc. However, vehicle knowledge is easy to pick up on the road. Van lifers love helping each other out, so you should be able to find someone to help you replace your brake pads or show you how to change your oil. Getting involved in the community. There’s a truly awesome community of nomads out there, and it’s just a blast connecting with everyone, going to meetups, and making new friends. Social media is a great way to get started. We’ve connected with so many people on Instagram that have since become friends in real life. The camaraderie and inspiration that’s abundant in the nomad community makes it a lot more fun to be on the road. Free camping resources. We need to find places to sleep at night, and we prefer not to pay if we don’t have to. Websites like freecampsites.net and apps like iOverlander and Allstays are great resources for finding free, legal camping just about anywhere. Last and – in my opinion – the MOST important, is a positive mindset. I always say that if you typically have a negative attitude, then van life is not for you. Things will go wrong, frequently. Your mindset is what will make or break you. Some nights you might have to sleep in a tent on some rocky gravel in the low 40s while your van is getting fixed (this literally just happened to us). Or your refrigerator will get unplugged without noticing, so all of your food goes bad. Or it won’t stop raining and WHERE IS THIS LEAK IN MY ROOF COMING FROM!? If you can’t be flexible with the unexpectedness of van life and remain open to what each situation is bringing to your life, it will definitely be a challenging lifestyle. But if you accept all of the ups and downs thrown at you as individual experiences you can gain from and learn from, you will be all the better for it and van life will be dramatically more enjoyable for you. What are the top 5 things that can make for an unpleasant van life? Well, going along with above – a negative attitude. It can truly ruin the entire thing if you can’t stop looking at a situation negatively. If you’re the type of person who lets a flat tire ruin your day, then van life might not be for you. Crazy unexpected things will happen, and you need to roll with it and stay positive. Negative attitudes don’t last long on the road. This is a personal opinion, but we hate spending time in cities. Driving and parking in cities is hell, there’s way too much going on, it can be challenging to find legal camping that’s not a Walmart, and we think most cities are all kind of the same anyway. That being said, there are plenty of people who build vans and only hang out in cities. Again, it’s up to the individual. Unpreparedness, I suppose could be one. We are pretty set for just about any situation. We have tools, first aid kits, and camping gear stashed throughout the van. That all comes in handy when we need to fix something on the road, or when the van’s in the shop and we need to sleep in the tent for a couple nights. Hot summer weather. Again this is up to the traveler, but John and I try to chase the cooler weather. It’s a lot more pleasant dealing with cool weather in a vehicle than hot weather. We have a small propane heater we can turn on when it’s too cold, but there’s just not really an effective solution for dealing with hot summer weather other than parking in the shade. Not being adventurous. Living in a van is adventurous in itself, but there’s lots more adventure to be had on the road. Van life is a lot better when you’re getting out of your comfort zone as much as possible. This can be a gradual thing, too. When we first hit the road, we sort of tiptoed into the whole thing. We started off mostly sleeping in state parks and actual campgrounds, and we didn’t have our first boondocking experience (camping in the wilderness far away from civilization or development) until about two weeks in. And trust us, boondocking on public lands beats campground camping every time. Not only is it free, the most beautiful and fulfilling spots are out in the middle of nowhere. But you need to be adventurous in order to find a lot of these places, because more often than not you’ll have to drive 10 miles down gnarly dirt forest service roads to get to them. What are your favorite meals to cook in your van or out in the wilderness? Oh man we have so many. I would say some of our go-tos would be chili mac, eggs-toast-avocado combos, we also looooove making lentils and quinoa, with enough to fry up some leftover lentil patties for sandwiches the following day. We also just resort to a bunch of stir fry situations. Just take whatever veggies and tempeh/tofu we have and throw them together with a bunch of seasonings and enjoy with some chopsticks! That brings us to your new E-book that just came out! Tell us a little bit about that. What exciting things do you have in the works and what should we look out for? 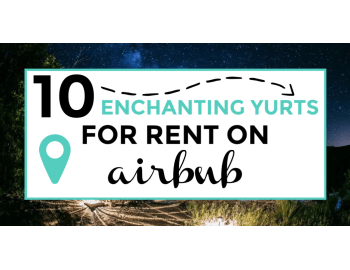 Did you have to sell your house for van life or plan on coming back to it? We decided to rent out our house while on the road in case van life figuratively or literally blew up in our faces. But, we will be heading back “home” for the holidays and plan to sell our house once the lease is up with our tenants. Van life is just way too awesome for us to ever consider going back to our old lives. Any plans for after van life or is it the van for life? We are actually in the process of mentally building a larger van that can hold car seats (No – mom, dad, in-laws, grandma, grandpa, Caiti, etc – we are not pregnant – just in the very early steps of planning). Eventually we would like to get some property somewhere, probably in the northwest. We don’t plan on permanently settling down forever, but we think it would be nice to have a little spot we can always go back to that we can call “ours”. We are wanting a lot of property that we can have fun building and testing out different kinds of tiny houses that we can temporarily live in and Airbnb out when we are not there. And we’d love to have campsites and a garage with tools set up so that fellow nomads can come hang out, work on their vans, and be part of a little “nomad village.” We also think it would be dope to have a large enough property that we can use part of it to house a Vipassana meditation – but that’s way down the road so we’ll see. How do you stay motivated? Does blogging help? Tell us a little about your blog gnomadhome.com. Anything else? The blog definitely helps. The followers help more than anything. It’s very inspiring to hear their stories and hear how our information and/or lifestyle has impacted them. We are very much so “helpers.” We always have been, it’s basically what our relationship was founded on – helping others. That’s what we aimed to do with our blog. When we were building our van, most of the information we found on the internet was outdated, misleading, or too specific to one person’s build. We couldn’t find a true universal resource that anyone could use to examine all the options and ideas for building out a van. So we decided to create a one-stop shop for all things van build, so that we can help others cut through the confusion and get on the road as easily as possible. We’re constantly communicating with and listening to our followers and trying to answer the questions they have about van life. 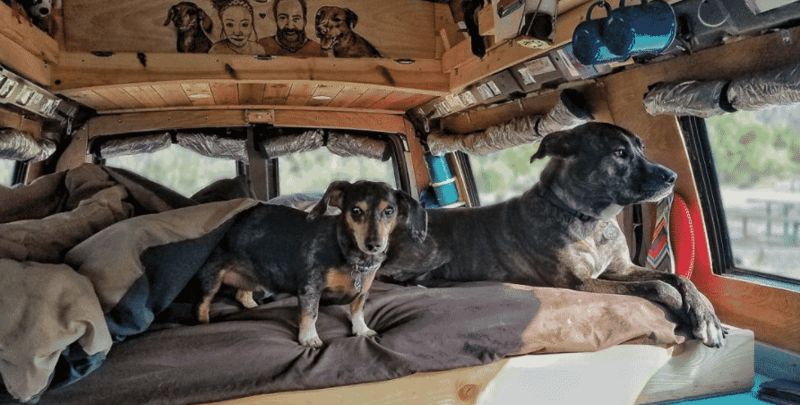 We just recently had a bunch of followers ask us about life on the road with dogs, so we are working on a collaborative post with other van lifers about their personal experiences with dogs since everyone’s travels and vans and dogs are vastly different. If you have any questions that we have not yet answered on our blog – reach out to us! We would love to keep the knowledge and information flowing to those who are searching for it! Another thing that really keeps us going is the nomad community. We’ve met tons of amazing people on the road, first through social media and now in person. We’ve been able to develop real life friendships with people that we initially idolized on Instagram. 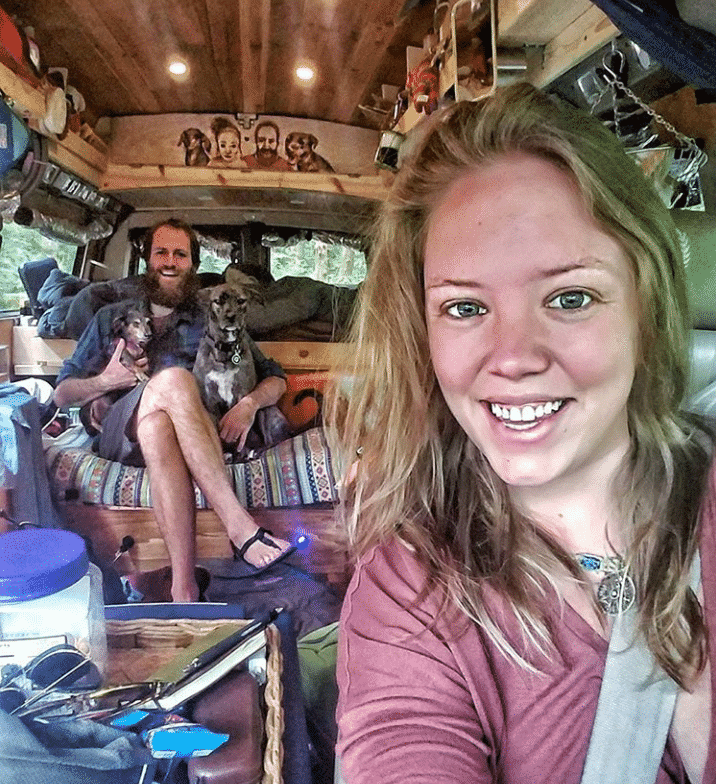 The van life community is incredibly open, accepting, and inspiring. Everyone is stoked on this lifestyle, and we all want to see other van lifers succeed and break free from societal constraints. There’s just something awesome about being part of a group of like-minded people all going through similar crazy experiences. The bonds we’ve formed are real, and we all kind of keep each other going. We are a quirky family of four (two humans, two dogs) that love traveling, adventures, new experiences, and finding the joy in life. We don’t love being tied down or squeezed into “little boxes,” which is why we decided to sell everything and travel the country with our dogs and our van. Check them out on their blog, social media and give them a follow! Very interesting!What an adventure it must be everyday! Oh my goodness, I wish I could live their life and live in the great outdoors, minus the dogs just add a grown son with autism 🙂 Great post on being young, chasing your dreams and looking to the future! Yes! So glad I found this post. It’s just the encouragement I needed that our dream really can pan out. We just packed up (and purged!) our 4 bedroom house. The renters moved in on Friday and we are at my parents for two weeks, before we hit the road right after Thanksgiving! We have a 5th wheel and are excited about the full-time road life, but definitely nervous too. The blog isn’t making much yet, but it’s slowly building. We will be looking for seasonal jobs until it’s at a place we can live off of. We will be a ski resort for three months, but then not sure after that. Do you mind sharing how you found the work on the farm?! We are looking for different jobs to do along the road! Thank you for this open and honest post! These tips are so helpful! I believe they used http://wwoof.net/ to find farm work. Visit their blog gnomadhome.com to ask any questions you might have!